Richard Saltoun and Karsten Schubert are pleased to announce an exhibition of Franz-Erhard Walther’s drawings from the 1960s. Walther, a contemporary of artists including Blinky Palermo and Gerhard Richter, has remained relatively unknown outside continental Europe with his first solo UK exhibition being held only in 2012 (at the Drawing Room, London). His ground-breaking artistic experiments with form, medium, and process during the 1960s has had a profound influence on a younger generation of artists working today. This exhibition is a unique opportunity to view his seminal works from the 1960s, in which he saw uninhibited action as integral to his artistic practice and process. All of the exhibited works are on paper, specifically industrial paper manufactured for everyday use, a medium which he saw as being process-orientated as it is intended to be used for everything but drawing or painting. The physical alteration of the paper’s material form through the addition of paint or water lends it an informal, objective quality uncontrollable by the artists’ hand. The line is a paramount motif running through these works, as Walther was interested in its ability to dictate and delineate space. 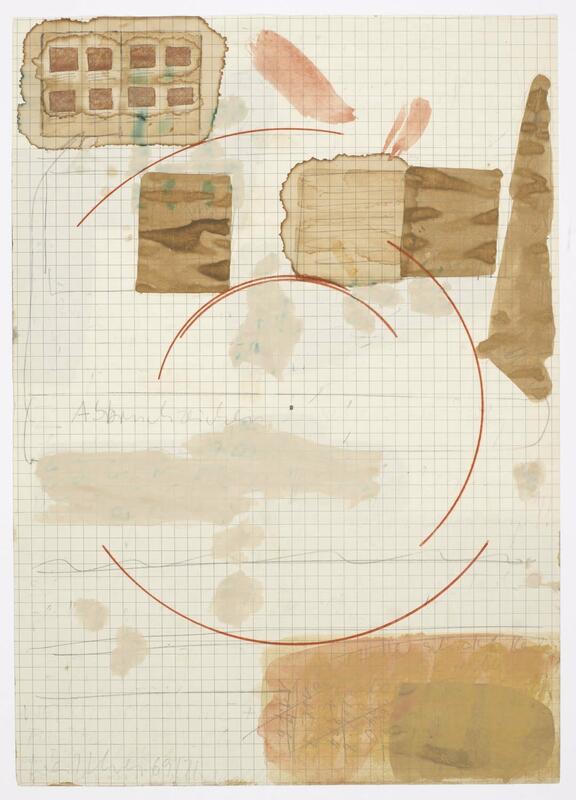 Untitled, a 1969-71 piece on lined graph paper, utilizes the systematic grid of the paper as a backdrop that he disrupts with loosely painted gouache and watercolor squares, semi-circular lines, and faintly drawn text. The effect is one of movement and uncertainty as Walther alludes simultaneously to order and chaos and, as with many of Walther’s work, the audience is invited to participate with the work – though on a visual rather than physical level.